Continuing in my quest of finding some delicious kid-friendly one pot recipes, here is a favorite! So simple and yet wholesome with tuna, vegetables and noodles. 1) Bring a large pot of lightly salted water to a boil. Cook pasta in boiling water for 4 to 6 minutes, or until al dente; drain. 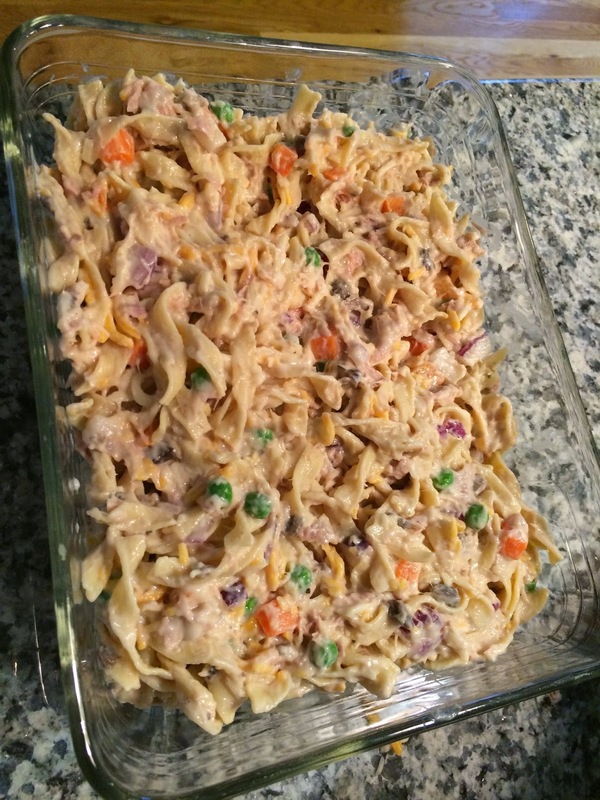 3) In a large bowl, thoroughly mix noodles, onion, 2 cup cheese, peas and carrot mix, tuna, soup cans and evaporated milk. Add a dash of pepper. 4) Transfer to a 9x13 inch baking dish (or two small 1.5 quart), and top with potato chip crumbs/fried onions and remaining cheese (handful). 5) Bake for 15 to 20 minutes in the preheated oven, or until cheese is bubbly.